Injured at work? 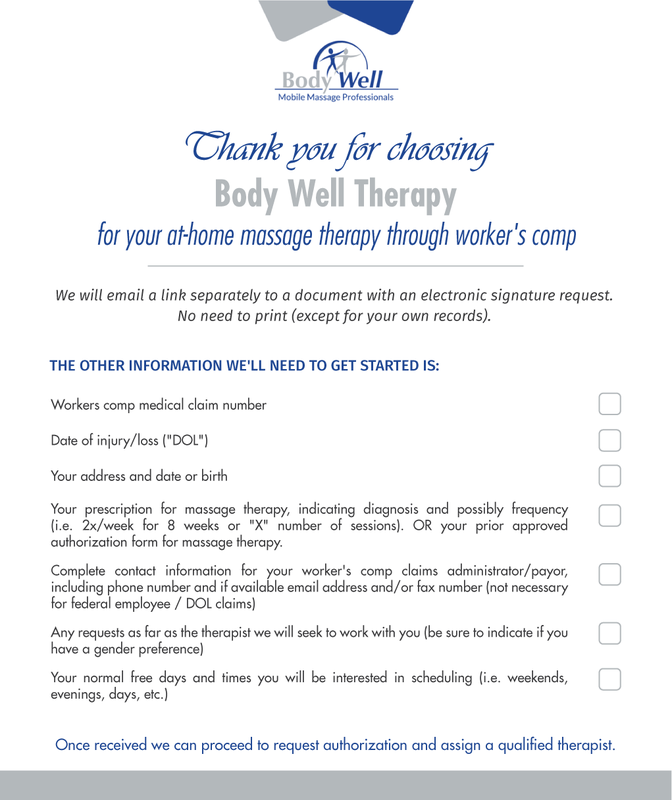 Receive prescribed licensed massage therapy in-home through your workers compensation claim. We accept most federal, state, local and private workman’s comp insurance. If you’ve been injured on the job, your workman’s compensation medical claim generally covers in-home therapeutic massage! Body Well Therapy accepts private, local, state and federal workers compensation insurance and requires no out of pocket co-pays. We are a registered provider for the U.S. Department of Labor Office of Workers Compensation Programs (OWCP) and have worked with numerous local governments plus private work comp insurers and care management networks such as Corvel, OneCall and Sedgwick. We have been in business since 2005 and have an A+ rating from the Better Business Bureau. *(New York claimants please note that we are no longer able to provide services through worker’s comp in New York State due to legal restrictions on licensed massage services). Whether you are a patient searching for a massage service that can work with your existing claim, or a Nurse Case Manager or other care coordinator seeking a competent provider to work with one or your patients, we are here and ready to get started! Since 2005 we have been providing quality, customized massage therapy to those who have been injured. When you work with us we have two primary goals: 1. Provide effective therapy by matching you with a therapist who is not only qualified on paper, but also well suited to your individual needs and 2. Make the process of getting started with your therapy as convenient and straightforward as possible by diligently handling all of the administrative tasks including pre-qualifications and authorizations. We will do all the legwork and phone calls for you! As indicated above, one of our goals is to make things as simple as possible, despite the complications inherent in workers compensation medical claims. As one of our clients, you can have a lot to do with how easily we can achieve this goal. The most important thing to avoid delays is to provide us as soon as possible with all of the requested information so we can get things rolling. Usually we will email a standard form to be electronically signed, along with an email specifying what information we need to proceed (your claim details, prescription, schedule preferences, etc). As soon as we have the required information, we will verify the claim and formally request an authorization to treat you. Once we obtain that, we will assign a therapist based on your indicated preferences and get started! If things work out, you can schedule the next visit with your therapist on the spot! Keep in mind that if for any reason you ever wish to use a different therapist, do not hesitate to let us know. We want to provide the best match for you. You are not stuck with whomever we happen to have available. In most regions there are many massage therapists who enjoy providing this type of therapeutic bodywork, so if it’s not a fit, we will keep working until we find one! (Although we have a very good record of getting it right on the first try)! You are also welcome to “bring your own” therapist! 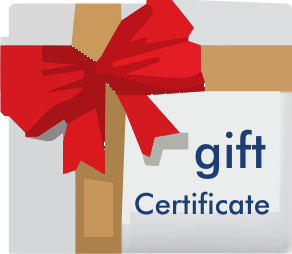 In most cases, as long as your existing massage therapist is properly qualified and insured, we can sign them up to work with you under our authority. If you and your doctor or case manager agree that massage would help your recovery and you would benefit from the convenience of our in-home massage services, please call us right now so we can answer your questions. With all of the requested information in hand, we can obtain authorization in as little as 1-2 business days! To avoid delay, if possible please request that your physician’s prescription indicates a diagnosis and frequency of massages prescribed (e.g. 2x/week x 8 weeks). If you have an existing authorization please fax is to us at (888) 929 9355. Questions? Ready to get started? Call us now and we’ll be happy to answer any more questions about how it works or how to get started. The best time to reach us regarding workers’ compensation massage through insurance is between 9 am and 5 pm EST, but you’re welcome to call evenings and weekends as we have in-house representatives available to take your information up until 10 pm EST. Call (888) 929-9355 ext. 1 now or complete our form below!